In my years of traveling all over the world, I’ve had my share of lost luggage. But the consequences for me were never so great as they were for a woman in the 1800s, when the course of an empire was changed all for the want of a dress. To set the stage, first let’s journey over beyond Bozen/Bolzano and over to the town of Meran/Merano, which is about 45 minutes away. Meran/Merano is still an active health resort, where people go to “take the waters” just as they did back in the 1800s. 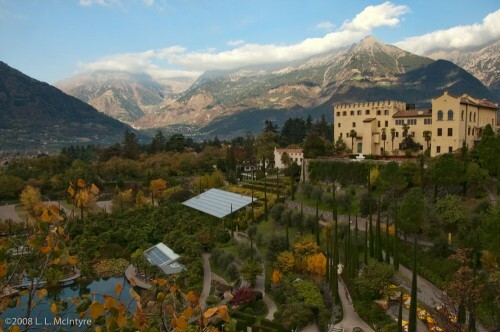 On the edge of Meran/Merano is the Schloss Trauttmansdorff, a medieval castle which has been modernized inside, with the castle grounds turned into award-winning gardens. In the 1800s, this castle once played host to the a woman who will be a central figure in today’s story of lost luggage. In modern times, it is estimated that one bag in 150 is lost or misdirected by the airlines every year in the United States alone. That’s a lot of lost luggage. However, the consequence of misplacing all those bags probably doesn’t come close to what happened to a girl named Helene when her bags — and particularly her dress — didn’t arrive at her destination on time. Of course, this had nothing to do with any airline losing her luggage, of course, as the year was 1853. Helene was traveling by carriage, sharing it with her mother and sister. All of their bags were traveling in another carriage. Helene was 19 at the time and on her way to meet the man whom her mother — and the man’s mother — had picked out for her to marry. But then misfortune struck: Helene’s luggage didn’t arrive on time when she got to the meeting point. So, she couldn’t change into the pretty party dress she was supposed to wear for the first meeting with her planned bridegroom-to-be. Instead, she had to stay in her dusty, austere and somewhat dowdy traveling outfit. As fate would have it, her 15-year-old sister, who had tagged along for the ride, looked far better in her traveling outfit. When Helene and her sister went to meet Helene’s intended bridegroom, he fell in love at first sight with Helene’s sister, and decided to marry her sister instead of Helene. This turned out to have quite a few far-reaching implications, since the bridegroom was Franz Josef, the Emperor of Austria, and Helene’s sister was Elisabeth, who after her marriage became the Empress of Austria — the role that had originally been destined for Helene to play. As you might imagine, Helene was initially pretty devastated by the whole thing, but she eventually bounced back and went on to become the Princess of Thurn and Taxis. Helene actually wound up having a happy, although somewhat brief, marriage to her Prince. In fact, she was reputed to be the only one of her eight brothers and sisters who found happiness in marriage. Although she became Empress, Elisabeth did not fare nearly as well. Over the years, Sissi, — as Elisabeth was popularly called — preferred to wander the world alone rather than live with her husband in Vienna. Sissi is described nowadays as the Princess Diana of her day: young, beautiful, royal, and very unhappy. Her visit to Schloss Trauttmansdorff in Meran was one of her typical sojourns: she stayed at the castle, venturing out each day on solitary walks in the neighboring hills, brooding about her life. In later years, people in their family were known to comment that the sisters’ fates were determined that first day, when the dress didn’t arrive on time for Helene to look her best at her meeting with the Emperor. For the want of that dress, an empire — or at least an imperial bridegroom — was lost. The Reluctant Empress: A Biography of Empress Elisabeth of Austria by Brigitte Hamann. A good overview of Sissi’s life, including excerpts from her diaries. The Lonely Empress: Elizabeth of Austria by Joan Haslip. Another well-regarded biography of Sissi. The Sissi Collection , a trilogy of highly fictionalized movies made in Germany in the 1950s about Sissi’s life and relationship with her husband (the soundtrack is available in both German and English). It’s a Cinderella tale of love and romance with a fairy-tale ending that unfortunately does not resemble Sissi’s true story at the end. However, the movies are fun, gorgeous, and unceasingly romantic; they are still so popular in Germany that they are shown every year on TV at Christmastime. This entry was posted in Beyond and tagged Beyond, castle, dress, elisabeth, empress, gardens, helene, history, meran, merano, sissi, Trauttmansdorff by leemcintyre. Bookmark the permalink.